Gary slept like a log – although sadly I couldn’t sleep thanks to his constant snoring. Breakfast was provided by the landlady, who didn’t once crack a smile. My morning pronouncements on expected mileage were greeted with amusement by Gary, who has taken to referring to them as ‘the Iraqi Propaganda Ministry bulletins' in debt to 'Comical' Ali's bulletins on the ‘success’ of the second Iraq War. But, after getting eye medication for Gary, we are finally faced with a beautiful sunny day with little sign of wind and we crossed into Scotland without much problem. A landslide on the A7 looked set to cause an even longer day. Instead – after a short B-road diversion – we were back on the road, but minus lorries and many of the cars, which had been re-directed. An incredible piece of fortune for us! With perfect conditions this looked like the first day we could get ahead of ourselves and actually enjoy what we set out to do, stopping at Langholm for an early break. 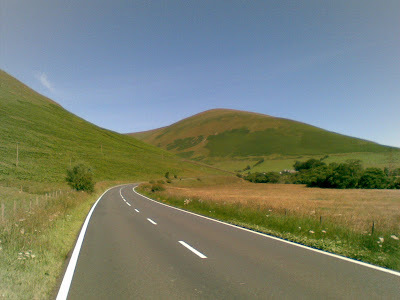 The countryside was now very beautiful and the gentle gradient of the road wound through the surrounding mountains to give a long downhill to Hawick for a quick re-supply. A perfect day to ride the perfect road...? Heading to Selkirk there was a series of three hills, which felt pretty much up and straight down again. By this time I've learnt that Gary likes to take his hills 'steadily' (ie slowly), so lunch was a welcome break. We continued on to Galashiels and to what threatened to be a big hill, but for once the landscape was kind as well as beautiful and the hill never really appeared. Instead there was a steady rise to a plateau. When we reached the top we could see Edinburgh a mere 15 miles away. And with 12 miles to go Gary declared that the ride was effectively completed – even if he fell off or had a puncture he could still stagger to the finish. The final miles were mostly downhill, but the traffic built up as we came into the city. But we eventually arrived at Waverley station at 6.30, way ahead of schedule. Found the very nice hotel and, after a couple of celebratory cans of lager we headed out to meet Gary’s brother Greg to celebrate completing the challenge! Next morning Gary was heading back early on the train, whilst I could dawdle around and buy some stinky cheese to take home. A stunning train journey back down the east coast to round off the trip. In summary what have we learnt?